The most fundamental strategy for solving problems is really obvious, when you think about it. When you feel stuck in a problem, all you need to do is to raise your level of intelligence to solve your problem. In other words, get smarter. The question is: how does one do this? It begins with accepting the attitude that your problem can be solved. Then, look at your problem's solution this way: all that makes a problem difficult is one's mental limitations. This really does make perfect sense. All that prevents you from finding a great solution to any difficult problem in your life, including money problems, marriage problems, parenting problems, health problems, emotional problems or professional problems is the current boundary of your level of intelligence. Someone with a high enough level of intelligence could solve your problem with ease. All you need is a sufficiently powerful mind, or the skills and knowledge of how to expand your mind-power, to resolve your issue and have your problem solved. 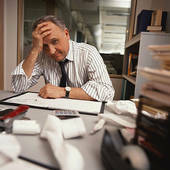 Encountering work problems and personal problems that seem too big for you to solve does not have to be disheartening. No problem is intrinsically difficult. A difficult problem becomes disheartening only if you doubt that you have the mental capacity to come up with the answer. This lack of confidence creates a blockage. If you trust in your ability to access the level of intelligence needed to realize your solution, you remove that blockage. When you're feeling stuck in a problem, the simple solution begins as you engage a higher level of mind-power. To raise your level of intelligence you need to be �open minded� about the possibility that there exists a plane of genius that can easily grasp the various elements of your situation and formulate a practical solution, and that you can connect with that plane. When you start struggling in frustration and consternation, shift into gently tuning in to a "higher mind". While conventional problem-solving frameworks would have you begin finding your solution by clearly defining your problem, here is an alternative approach. Begin by clearly defining your SOLUTION, in the simplest possible terms. This amounts to defining your goal or describing THE OUTCOME you want. For instance, during a recent team building training in which I led a group of managers in working with this creative solution process, someone raised a fairly typical leadership challenge: employees expressing grievances improperly. Once you state what you would like to happen, the next step is to imagine that there is level of mind that can easily figure out exactly what to do to accomplish this objective. Your next step involves imagining that your mind is connecting or melding with this higher mind level. Finally, remain patient, relaxed and alert while trusting that your solution will descend into your conscious awareness. Your mind needs to be free and clear of doubts about your ability to receive your solution. Otherwise, those doubts fill up the �space� in your consciousness, leaving insufficient mental space in which your solution can blossom. Worrying about how long the process is taking clogs the conduit through which your solution needs to flow. Keep an open mind as you abide in a calm, relaxed, receptive state of awareness. This is one way to get smarter for problem-solving. For great leadership tips for strategic thinking, problem-solving, motivational team building and visionary leadership, schedule a motivating Leadership Development Seminar or motivational speaker event.